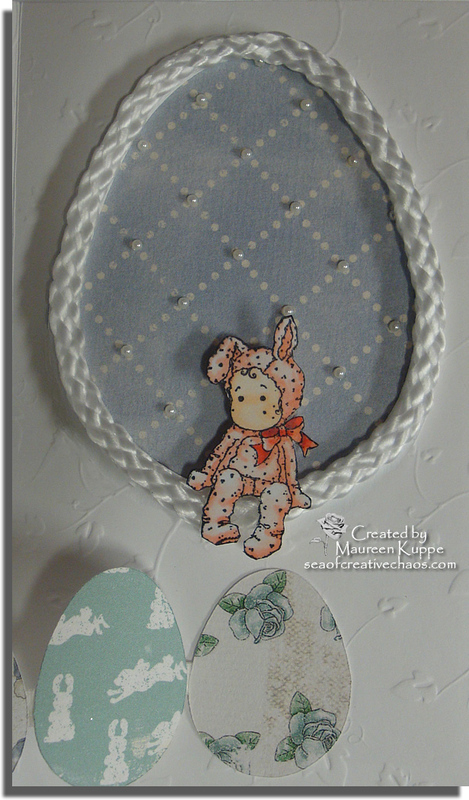 For today's card, I created an Easter card with a mostly white front is simply adorned with Mini Chicken Tilda, a few Wild Orchid roses and ribbon. But she seems a tad lonely, no? Mini Tilda Painting Egg and Mini Bunny Tilda are all ready for Easter to arrive! 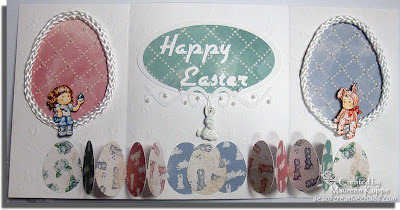 This trifold of embossed white cardstock opens to reveal a foldout row of Easter eggs. The two larger eggs are outlined with white satiny cording I saved from a shopping bag (I told you I never throw anything out!). 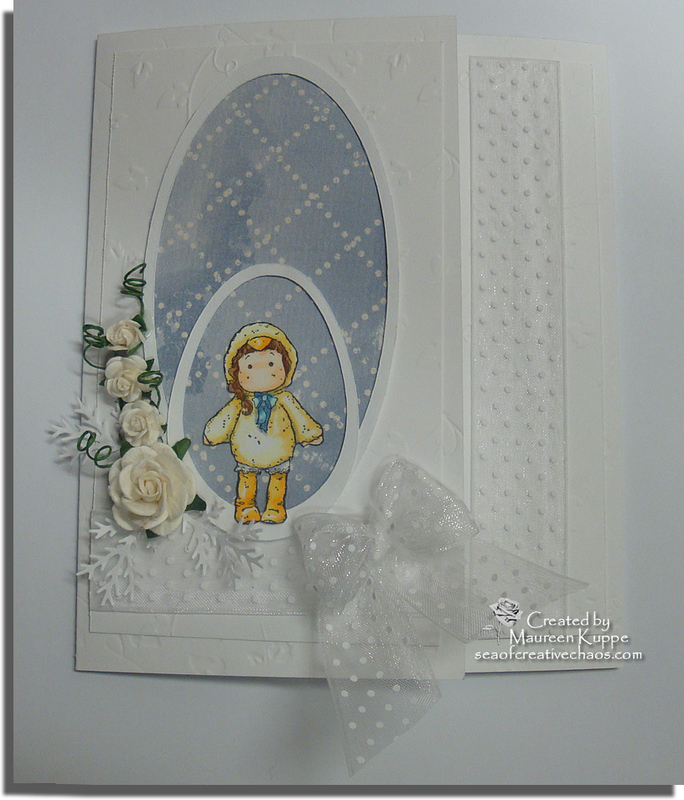 The charm came in a silver colour, so for this card I painted it white and then sprinkled some Martha Stewart White Crystal Fine glitter to add a touch of sparkle. 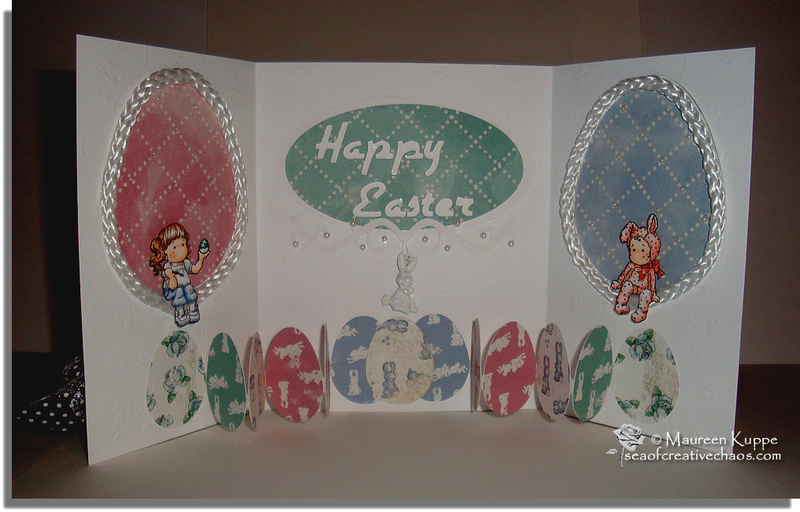 A few self-stick pearls were added to the inside of the card as well. And you know what? They DID! So take it from me; it never hurts to ASK! I was SO excited!!! I didn't realise until I got it home the reason it was priced so high - the black machines were a limited edition... wow! It fits my room's decor perfectly and I have been playing with it using it every day since... and it was put to work cutting my title, eggs, frames and swirl for this project. There is no way I could have cut all those eggs EXACTLY the same otherwise! Whew! 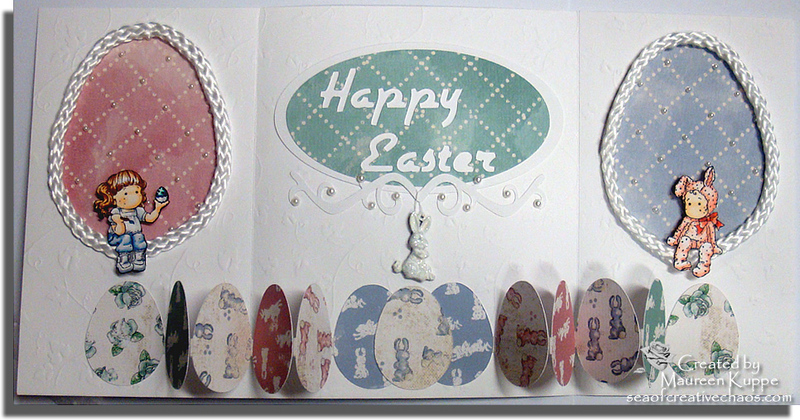 I hope you like my Easter greeting. I'm proud to say that the Canadian Red Cross, to whom we donated, raised over $ 1 million for the Japanese Relief Effort in just this past weekend alone. Here's a list of organizations from Yahoo Canada and Yahoo US frontpages in case you'd like to help too. Canadian Red Cross: Call toll free at 1-800-418-1111 or visit the webpage dedicated to providing relief in Japan. Donate here. American Red Cross: Emergency Operation Centers are opened in the affected areas and staffed by the chapters. This disaster is on a scale larger than the Japanese Red Cross can typically manage. Donations to the American Red Cross can be allocated for the International Disaster Relief Fund, which then deploys to the region to help. Donate here. CanadaHelps: Check here for an indepth listing of Canadian charities providing aid to those in need. Oxfam Canada: Teams and partner organizations are on-site and monitoring the situation from the ground. Donate here. Global Giving: Working with Save the Children, International Medical Corps and others to provide support on the grounds of Japan. Donate here. ADRA Canada: ADRA Japan has extensive experience with providing national and international support to those affected by such disasters. Donate here or call 1.888-274-2372. UNICEF: Closely monitoring the situation in Japan and prepared to provide assistance and relief. Donate here. Save The Children: Mobilizing to provide immediate humanitarian relief in the shape of emergency health care and provision of non-food items and shelter. Donate here. Salvation Army: The Salvation Army has been in Japan since 1895 and is currently providing emergency assistance to those in need. Donate here. Americares: Emergency team is on full alert, mobilizing resources and dispatching an emergency response manager to the region. Donate here. Convoy of Hope: Disaster Response team established connection with in-country partners who have been impacted by the damage and are identifying the needs and areas where Convoy of Hope may be of the greatest assistance. Donate here. International Medical Corps: Putting together relief teams, as well as supplies, and are in contact with partners in Japan and other affected countries to assess needs and coordinate our activities. Donate here. Shelter Box: The first team is mobilizing to head to Japan and begin the response effort. Donate here. Yep. I'm thinking of you, our Japanese friends (and pets, animals and wildlife too!) in your dire time of need. I used Japanese Tilda, with some beautiful Japanese Yuzen Washi paper a dear friend gave me as a gift. 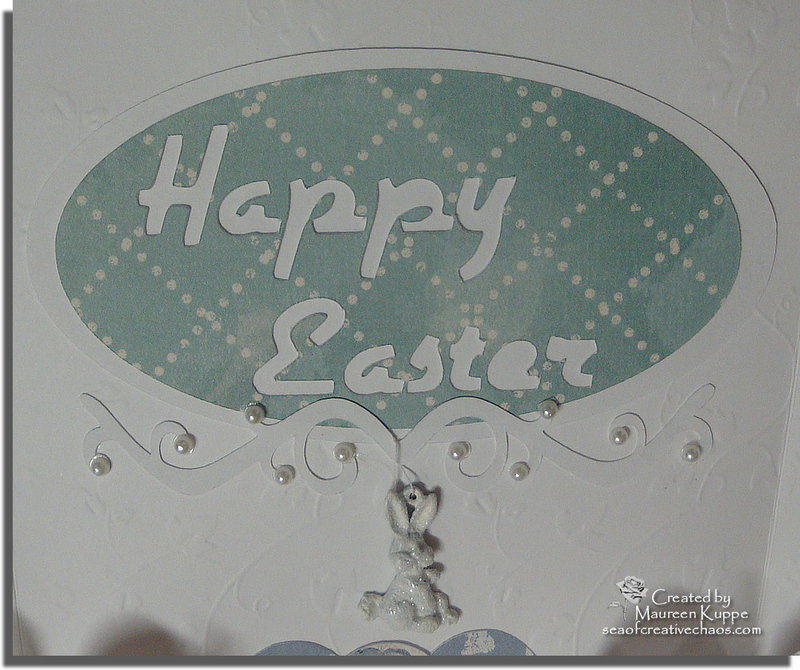 I cut it out and layered it over a "half easel" blue cardstock base. 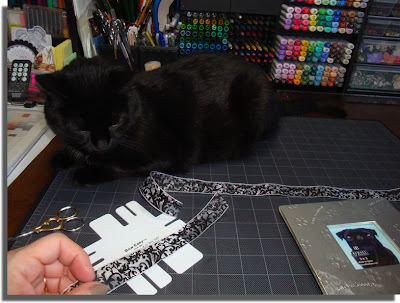 That same wonderful friend also ran off some black oriental bridges for me on her Cricut so I layered two of them with some black-coloured dimensional foam in between. I pulled out daughter's Origami book and made a bird (called "First Flight") with gold paper. 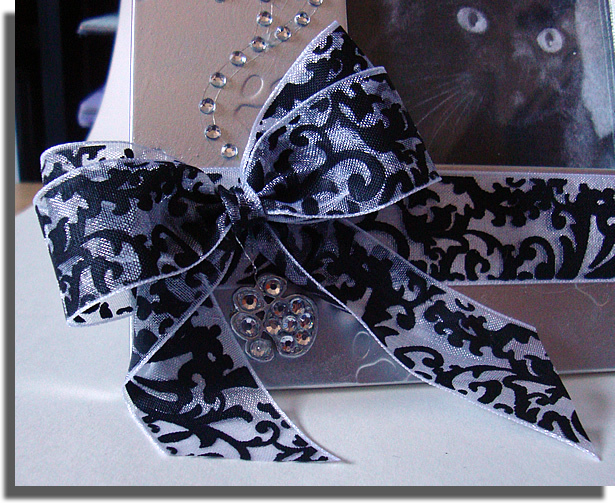 The ribbon is from my stash; you may recall it on my last card. 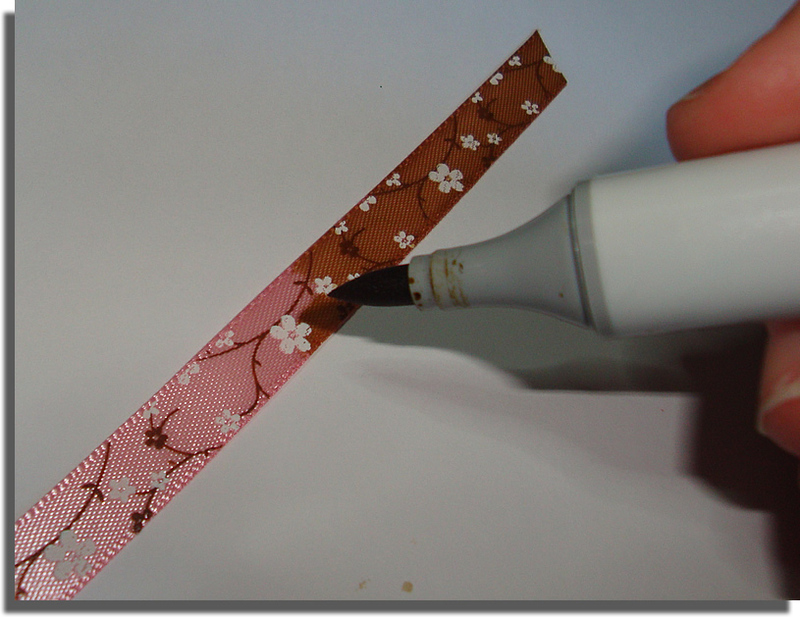 However, I didn't want it pink, so I took my Gold #Y28 Copic to it and coloured it. A gold leafing pen gave it some shiny gold highlights, which was also used on Tilda's kimono. The stamped sentiment is from Stampendous. 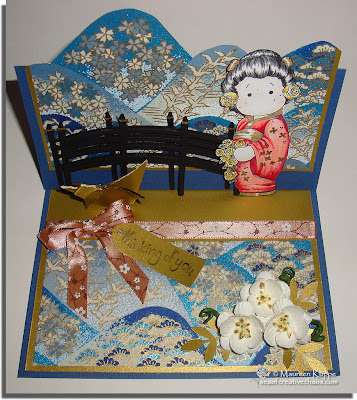 Cherry blossoms are from Wild Orchid and I used my Martha Stewart punch for the gold leaves. 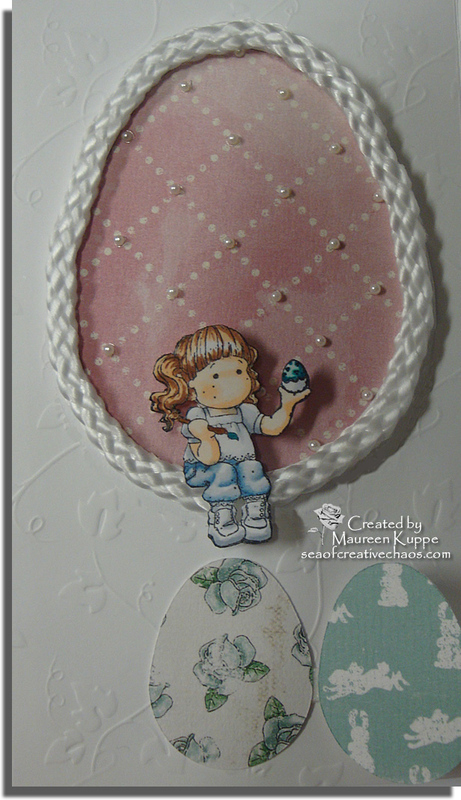 Here's another card I created using my new "Sweet Dreams" digistamps... this time using the mini-sized images to accompany my Mini Happy Tilda. 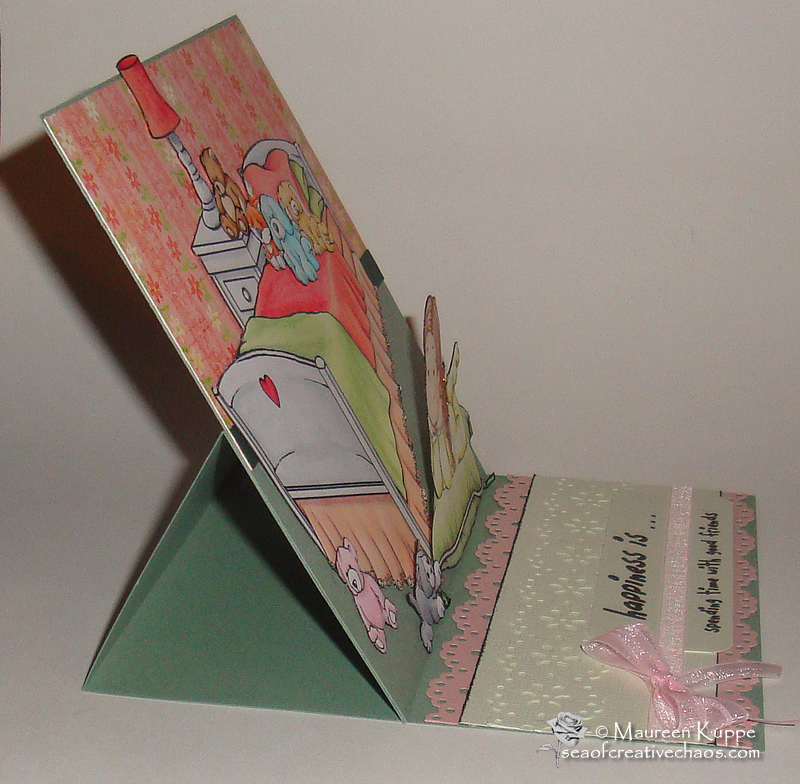 This is a regular-sized card with a simple pink cadstock base. 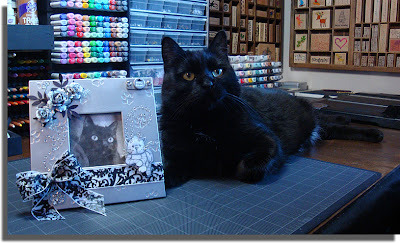 This time I wanted the card to be light but girlie; so I scored panels into a piece of white cardstock for Tilda's walls. I also added two strips of cardstock for the baseboard. I coloured Tilda, the bed, nightstand, teddy, dresser, toy dog and toy cat with Copics and popped them all up on dimensional foam for added depth. 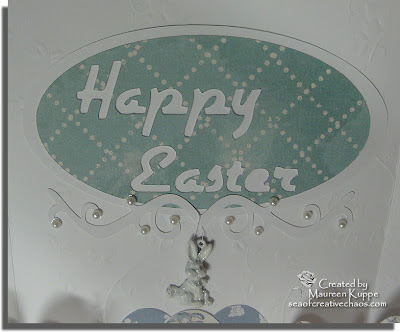 A simple "Happy Everything" stamp was added and then to give it all a bit of sparkle, I used my new Martha Stewart Crystal Fine glitter on a Sizzix die cut under the sentiment. 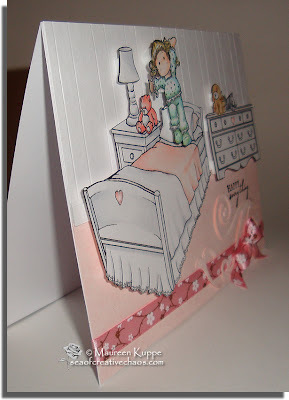 I added the same glitter to the two hearts on the bed and dresser. The ribbon is from my stash. 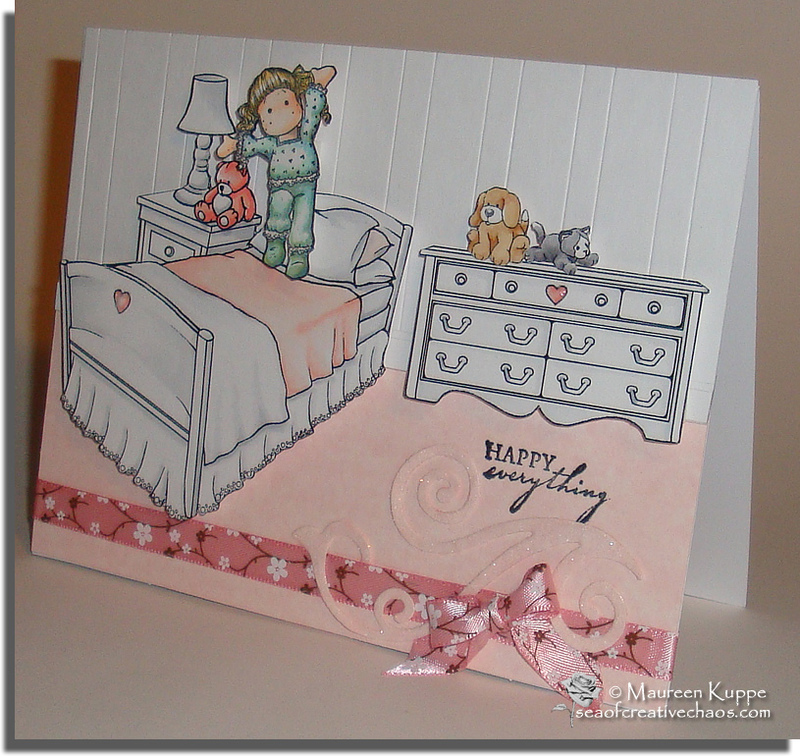 To get your own bedroom set for Tilda, head over to my DigiDrawn site to see it and other Magnolia scenarios HERE. Finally! 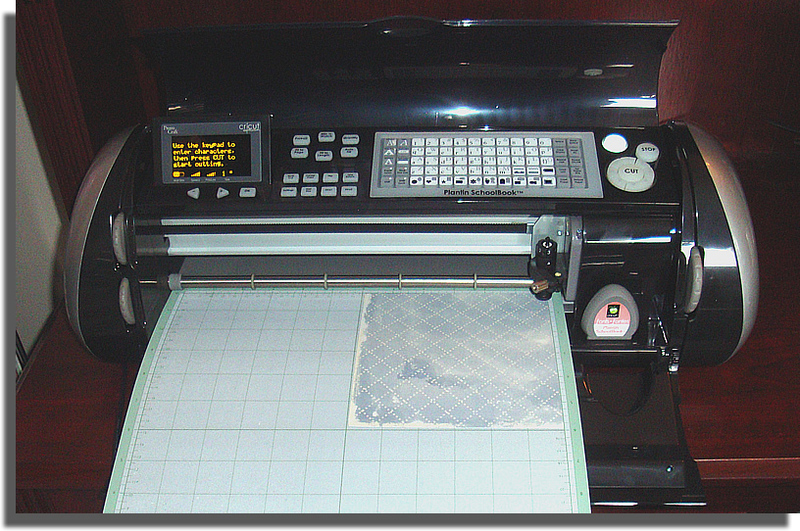 A new scene has been added to the Scenarios and Accessories section over at DigiDrawn.com! 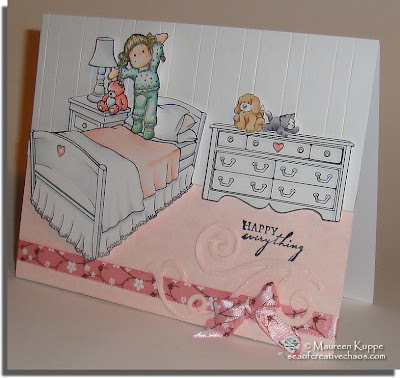 One of my most requested images has been a bed for our dear Tilda (ever since I created one of my first Magnolia cards with Happy Tilda jumping on her bed). Well today I unveiled "Sweet Dreams", 2 sets of six images each scaled for both regular and mini Magnolia stamps. It includes the bed and nightstand (as seen above), a bed without the nightstand, matching dresser, a big comfy floor pillow and two new toys: a puppy and a kitten! 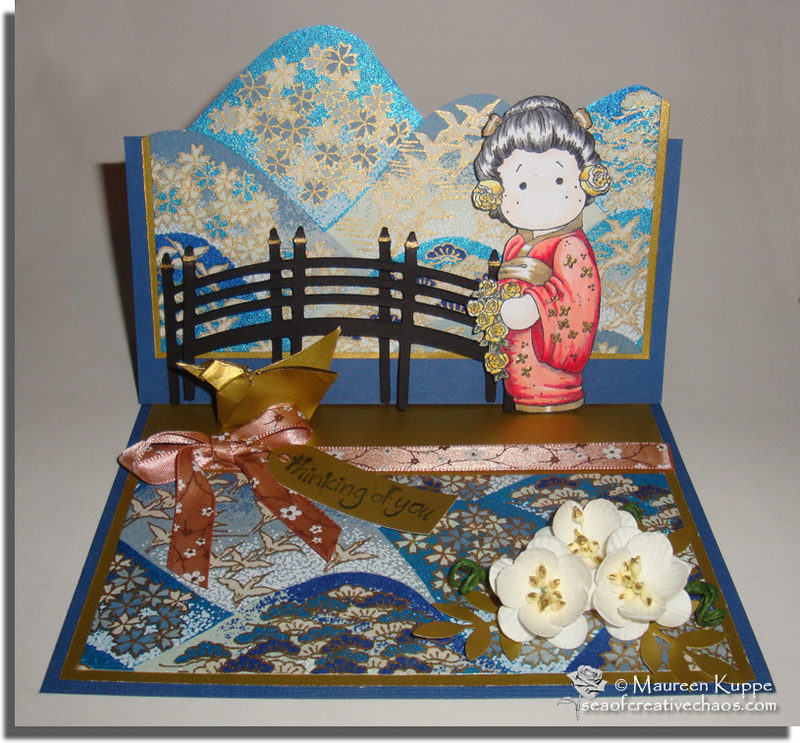 The sample card above was created using a 6 X 6 easel card as the base. The full size "Dreamy Tilda" fits perfectly on either the bed or pillow! I used a piece of clear plastic scored and shaped into an "L" to mount Tilda, the pillow and the toy cat to the base of the card with Scor-Tape. She folds flat when the card is closed, and holds the front when the card is opened! The paper I chose for her bedroom wallpaper is Basic Grey's "Oh Baby! Girl". My Martha Stewart Doily Lace punch was used on the base, and Gold Stickles were added to Tilda's wings. 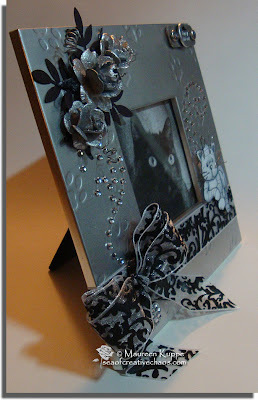 Ribbon is from my stash and the sentiment is computer generated. 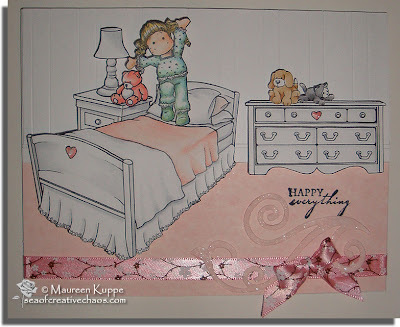 I added three other of my digistamps to this card; the pink teddy bear, baby fox and fuzzy bunny have joined the fun in Tilda's room. So if you'd like this bedroom scene for your Tilda, head over to DigiDrawn HERE to order! 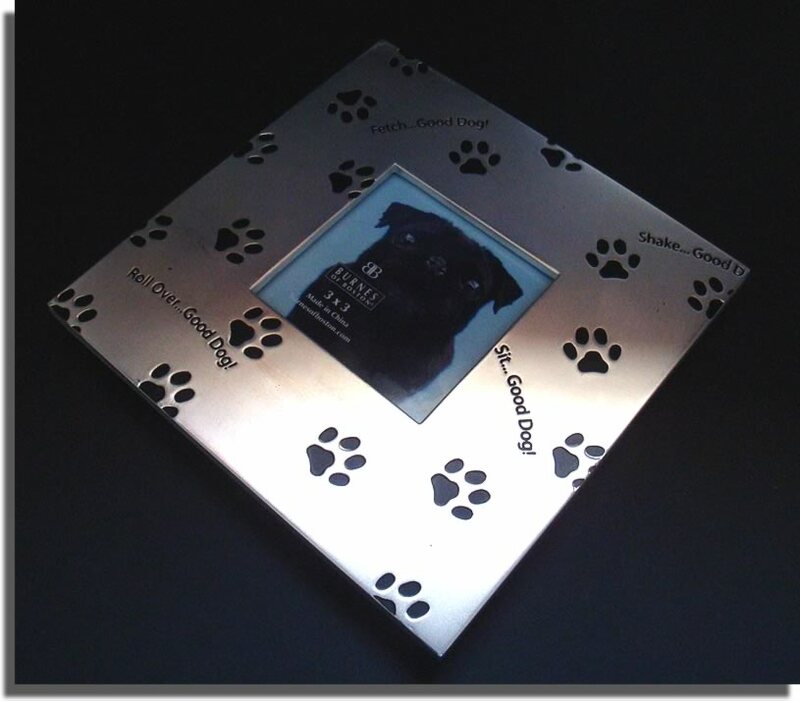 I popped by our local Salvation Army Thrift Store recently and found a tabletop frame that I thought could use a re-purposing; a metal frame with pawprints! Only one problem: is was for a dog and I wanted to frame one of my cats photos. So I started by getting out my Krylon Silver spray paint and repainted the whole frame. I have a matching Krylon Silver Leafing Pen, so I used that for all the accents (except the flowers which were spray painted too). 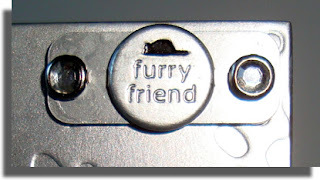 I had a pawprint charm in my stash that had a broken connector and two missing pink gems. So after giving it a whole new coat of silver, I glued new gems (the same ones used on the swirls) onto it. A silver thread attaches it to my bow; the ribbon is a "Celebrate It" sheer ribbon from Michael's. 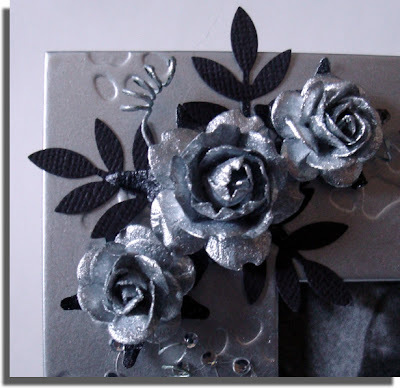 As I mentioned earlier, the roses from Wild Orchid Crafts were spray painted silver with black leaves made with my Martha Stewart punch. The gem swirls are from the Dollar Store. The "Furry Friend" charm is actually a brad I adhered to a brass plate using ScorTape. Two brads with clear gems were added on either side. The Laying Cat Maggie stamp is coloured with Copics C0, C3, C4 and C6. 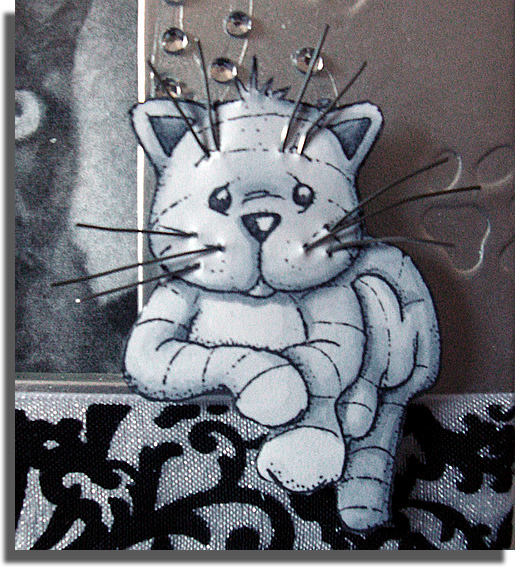 Since it would be near impossible to cut out the whiskers, I decided to replace them with silver wire. 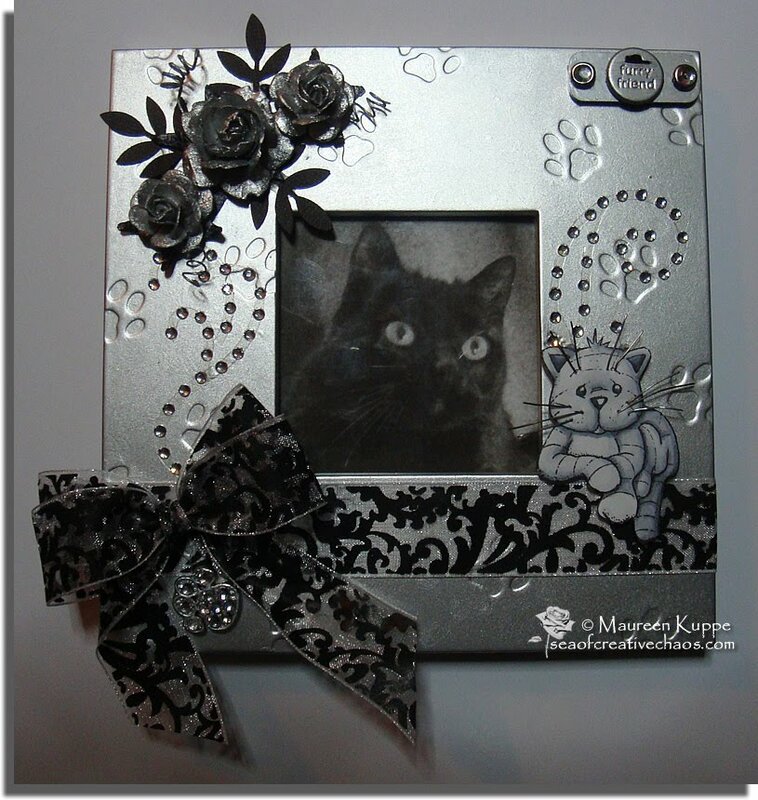 After colouring, I used a needle to punch holes in the cat image and inserted wires, taping them into place on the reverse side.